Understanding all of these areas can be helpful in gaining an improved understanding of the business environment and pressures on organisations in this industry. 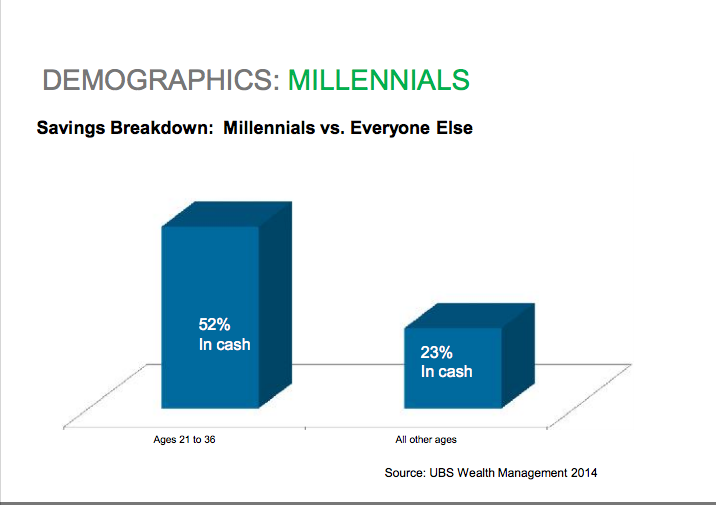 Taking women and millennials first, it is argued that both markets are increasing in wealth management. 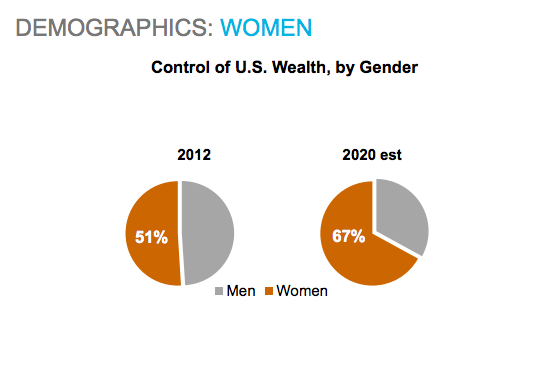 It is explained that women in the United States have control over approximately 50 per cent of the wealth there. However, that figure is set to grow to control over two thirds of the wealth by the year 2020. There are a number of underlying reasons for this including the fact that women are living longer, that they inherit wealth and because they are increasingly present in the workforce. Men and women look for different things from advisors, and this is something that advisors need to be aware of when trying to offer investment options to such clients. However, the millennial market is also growing for wealth management, yet many organisations have not taken this change on board, instead focusing on baby boomers and those that are retired. Millennials may not necessarily have a lot of wealth behind them at the current time, but they are driving change in the industry such as the move to the use of robo advisors. 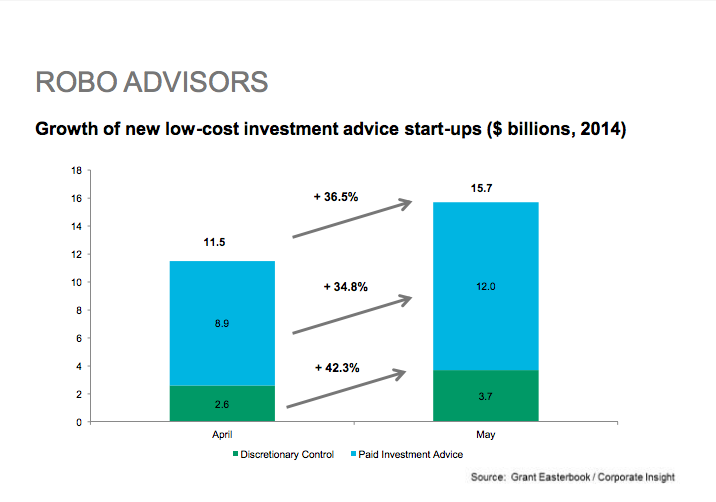 They will be less likely to use advisors. 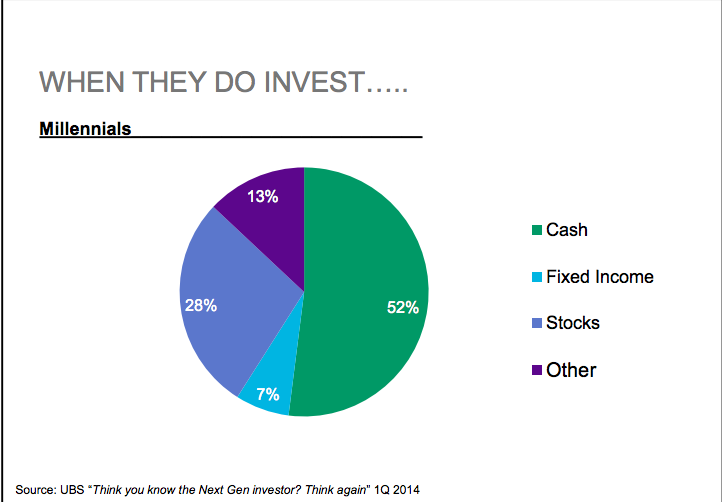 They also have other qualities that are different from investors in other generations. For example, it is argued that they are less willing to take risk. 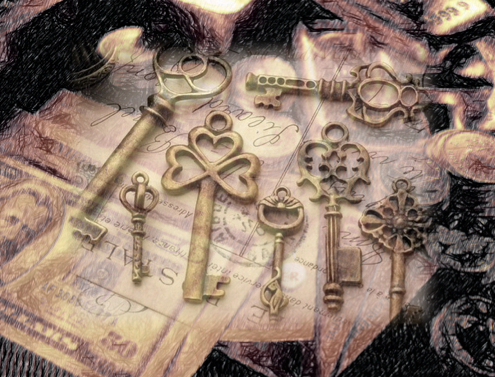 Advisors need to adapt to succeed with them. The talent shortage is also having an impact on the industry. It is argued that in just the past seven years, there has been a reduction of 50,000 financial professionals in the market. The average age for finance professionals is close to 50, and data shows that only a very small percentage of advisors are under the age of 35. This shows that the industry has not made itself very attractive to younger people to work in. When looking at the reasons why people do not go into the finance industry it was found that some did not see it as a career option, others saw the industry as unethical, and others still did not want to do a sales job and viewed this role as precisely that. This needs to change if the industry is going to be able to continue to meet the needs of its customers in the future. On the subject of fluctuating prices and margins, it is argued that one problem is that people who invest through wealth management services do not particularly benefit from being wealthier. People who have more also pay more. This is unusual in industry in general. There are a bunch of problems that are associated with this such as a lack of productivity, cost control, gaining the right client mix and offering the right services. 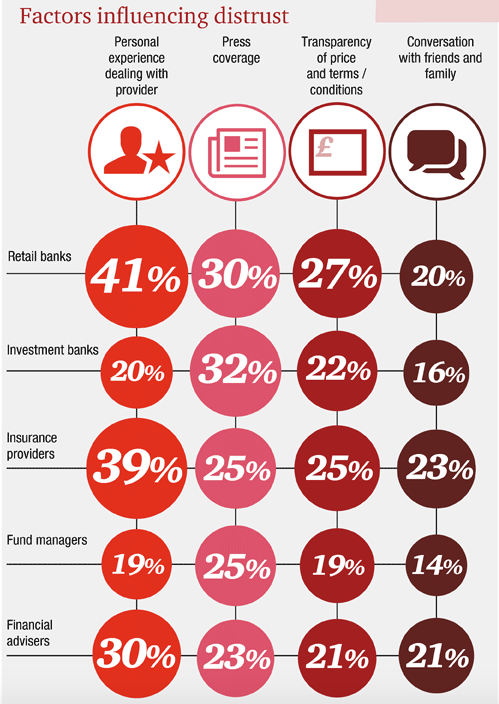 With regard to this area wealth management firms need to focus on profitability and optimising the bottom line. Evolving investment management is another problem in the industry. The number of different kinds of investment funds available and the growth of cheaper services has led to a large range of different kinds of investors in the market. Where the market used to be focused just on the very wealthy, there are now new kinds of investors that are looking for different approaches and strategies than in the past, and not just hedge funds or limited partnerships. There are other factors that impact wealth distribution changes. As per Tom Robinson, CFA Institute, among other factors, trends in demographic and technology were mentioned as the main factors. The latter implicates social media, cyber security and robo advisors. We reflected in our previous posts what are Robo Advisors, how Robo Advisors work and who are the best. Wealth management services need to respond accordingly and offer a greater range of portfolios that do not just include stocks and bonds. 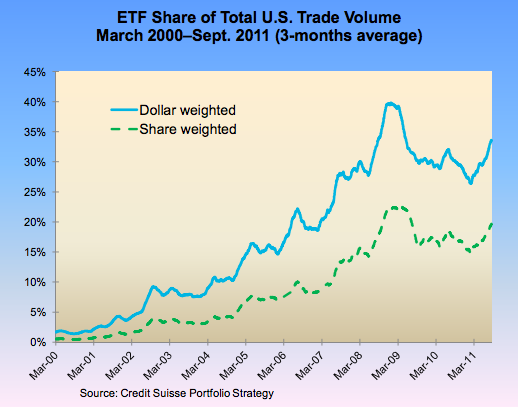 Low cost exchange-traded funds (ETFs) also need to be offered, since clients are looking for these. Whatever the prognosis we will build, it is not possible to get aligned without Trust. 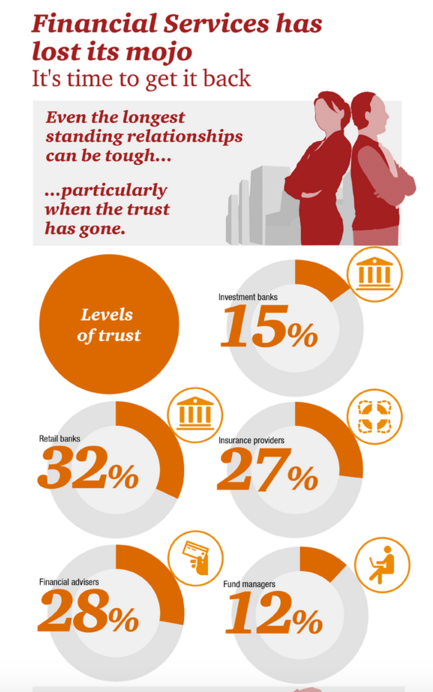 As per Edelman Trust Barometer, financial services are the least trusted industry globally. Fees are the main impediment towards value adding services of wealth management, especially in time of emergence of Robo Advisors that do not charge any fees. Therefore, it is argued that while some wealth managers will still be able to justify a very high price, others simply will not be able to do so. Wealth management firms will in general have to show that they offer value to their customers, rather than assuming that it is acceptable to charge very high fees. Ultimately those organisations that adapt will survive, and those that do not may expire. Considering all the above mentioned factors, and keeping in mind that this is just a summary of them, there is a lot that needs to be evaluated before structuring a flexible strategy.